The poker industry in New Jersey’s Atlantic City gambling region has had quite a transformation in the last 5 years with the launch of their NJ online poker platform. These online poker sites are owned and operated by various members of the distinguished Atlantic City casino industry and are licensed and regulated by the state of NJ. These new state-based online poker options expand the selection of USA online poker playing options that already includes existing legally licensed offshore poker sites welcoming NJ players. Aside from Nevada and Delaware, New Jersey is one of the few states offering state-based online gambling opportunities to their residents and visitors. This portion of our guide is dedicated to taking a close look at New Jersey poker, both online and brick-and-mortar options will be addressed, with an emphasis on understanding the online card playing arena. Our intention is to provide a valuable resource guide which will strengthen the position of our visitors when making informed decisions regarding their online gaming activity. We take a look at the legalities, the available options, and how to navigate the poker playing field in NJ. Is Online Poker Legal In New Jersey? Not only is it legal for residents and visitors to participate in online poker games, it is legal on multiple levels. What I mean by this is that players have the option of choosing from legal state-sponsored online gambling as well as legally licensed and certified offshore online gambling options. This gives New Jersey residents a much larger selection of online poker choices than most of the United States players have access to. 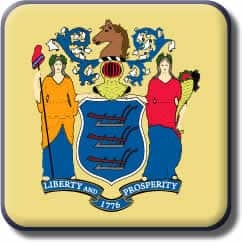 State laws were modified in 2013 to allow legal online poker gambling that is owned and operated within the state of New Jersey, specifically Atlantic City. These sites are licensed and regulated by the state. The state has allowed legal brick-and-mortar poker gameplay for quite some time. You can learn more about the legality of gambling in the Garden State by reviewing our guide to New Jersey online gambling laws. Below you will find the table which lists various online poker sites. Each of these brands has been carefully reviewed by our team of specialists. They have all been confirmed to be operating legitimately within the industry and to offer a high quality and secure online gambling experience. We have included their current welcome bonus offers so that players can compare at a glance which brands may be the most advantageous for their specific circumstances. They are all USA friendly and welcome players from the state of New Jersey and the United States in general. What Games Are Offered At New Jersey Online Poker Sites? While game selection at the state-based poker rooms may be limited, offshore poker sites have a much more generous menu of online poker games on offer. You will find multiple variations of Texas Holdem, Omaha, and Stud poker, as well as more exotic games such as Caribbean Stud and HORSE. Premium online poker rooms will also offer an active tournament schedule that provides a variety of tournament options and promotions around the clock. Thanks to technological advancements in the online gambling industry, mobile poker sites are now available and offer a remarkably robust gaming experience from your smartphone or tablet. Are There Any Online Poker Bonuses Available In NJ? Both state-based and offshore poker sites offer various incentives for playing poker online, however, the offshore brands typically have the more attractive bonuses. You will find the traditional welcome bonus in which the poker site offers to match a percentage of your deposit up to a maximum amount. The offshore sites also offer reload bonuses, bad beat bonuses, a host of tournament promotions and bonuses, referral bonuses and more. The welcome bonus offers are usually awarded incrementally so the more you play, the more of your bonus money you unlock. How Do I Know If A New Jersey Online Poker Site Is Legitimate? It is a safe assumption that the online poker sites licensed by the state of New Jersey are legitimate. The state is well versed in regulating the gambling industry. When it comes to the offshore online poker sites, more due diligence is in order. While these sites do offer the most attractive bonuses, incentives and gaming options, it is also a little more complicated to vet their legitimacy and quality. The best way to ensure that you land a legally sanctioned and reputable offshore poker site is to consider the input of industry professionals such as the creators of this guide. We are experienced in the assessment of online poker businesses, and as industry insiders have access to information that the average player does not. Why Don’t I See Any Of The State-Sponsored New Jersey Online Poker Sites In Your Recommended Brands? To be honest, it simply is not necessary to include the state’s local poker sites here because they are not of a questionable nature. They are held to stringent licensing requirements and subject to comprehensive regulatory oversight. We felt our efforts were better spent on providing information about the offshore poker sites to reveal the most reputable options that are operating legally within the industry. Information about this segment of the gambling market is not as prevalent, so we wanted to fill that void as a reliable and trusted resource. These offshore sites may not have the NJ state government behind them, but the ones listed here are subject to strict regulatory oversight by a legitimate and respected governing jurisdiction.